People with a healthy relationship with money view it as a tool. 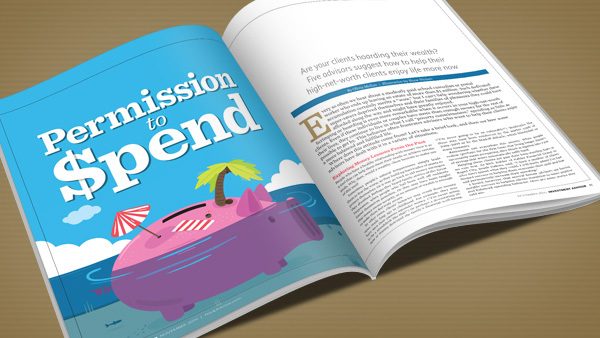 So why would a wealthy client hesitate to use it? Every so often we hear about a modestly paid school custodian or postal worker who ends up leaving an estate of more than $1 million. Such dedicated accumulation certainly merits a “wow,” but I can’t help wondering whether these super-savers deprived themselves and their families of pleasures they could have afforded along the way and might have greatly enjoyed. Scrimping or hoarding is even more remarkable when it occurs in your high-net-worth clients. Even if these individuals or couples have more than enough money for the rest of their lives, they continue to live in what I call “poverty consciousness,” spending as little as possible to get by. This behavior often frustrates advisors who want to help their clients enjoy a more balanced and fulfilled life. Where does this attitude come from? Let’s take a brief look, and then see how some advisors have dealt with it in a variety of situations. People who have a healthy relationship with money view it as a tool that can help them meet their needs or achieve certain goals. Why, then, would a wealthy client hesitate to make use of this tool? Sometimes people’s natural temperament simply leads them to fear the worst, so they build up barricades of assets to protect themselves. Or it may go back to old money messages they absorbed. Perhaps they heard family stories of the Great Depression, when people who had been well off suddenly found themselves penniless. Or they may have been taught that money means security, so no amount of wealth is enough to make them feel truly secure. In other cases, clients’ behavior may result from money vows made long ago in childhood. For example, they may have seen their parents squander money. (“I’m never going to be a spendthrift like that!”) Or perhaps a devastating illness or trauma destroyed the family’s financial well-being. (“I’m never going to be so vulnerable!”) Tendencies like these may have been reinforced by the market crash of 2008–2009 or by the Madoff debacle, which blindsided so many investors. Retirement can exacerbate this anxiety. When people realize (perhaps for the first time) that living longer doesn’t necessarily mean prospering, they flinch at dipping into a pot of savings that won’t automatically refill itself. I found, however, that several female advisors are having notable success in helping clients transition to more positive and balanced spending behavior. Here are some stories they told me. A client I’ll call Mary is one of my success stories. When she inherited over $500,000 20 years ago, she didn’t want to touch it. Even as it grew, she and her husband kept working, saving and living a simple lifestyle. As Mary neared 60, she admitted some of her inheritance could be used when she retired. So I urged her to practice using it before retirement. She was to ask the investment company to put $100 a month into her personal discretionary account. Then she was to use the money any way she liked. This was difficult for her. Just asking for the money to be transferred took months. After a year, though, she became used to spending the $100. At that point I recommended she start withdrawing $500 a month in order to take an occasional day off or spoil her grandchildren. She willingly agreed because it let her focus on something joyful. This went on for a couple of years. When her nursing job got quite tiring, I suggested she cut back to part time. This time I suggested taking $1,000 a month from the invested inheritance, which had grown substantially despite her small withdrawals. After talking it over with her boss, Mary gradually reduced her hours. Having the extra $1,000 meant that she hardly noticed the salary cut. In fact, she had more money since she was not commuting or overspending to offset exhaustion from her work. After years of this strategy, she was more than willing to take out $2,200 a month and retire before her 63rd birthday. It took some time, but once Mary began to accept what she had and saw the benefit, she was able to claim, appreciate and enjoy her inheritance. A client of mine lost her husband six years ago. She has more money than she will ever be able to spend, but she doesn’t seem to know how to enjoy it. Leaving it to her children and grandchildren doesn’t excite her. However, I’ve nudged her to do more traveling with her kids and grandkids. This year she took her daughter, son-in-law, two grandkids and a grandkid’s spouse on a trip to Alaska. I believe funding family reunions is a great way for wealthy people to spend money. It gets the family together and allows the older generation — who are often our clients — to get to know the younger generation and pass down family stories and values. Shortly after the death of her husband, another client of mine decided to build a family getaway in the mountains. She spent several years planning and building a cabin, which she saw as a way to bring her family together. On major holidays, my client, her son and his family, and her daughter and her husband all meet there. The cabin has been a wonderful investment for her since it provides very rich family time. We have conversations with our clients about what they want to do and what they want or need to spend money on. Using MoneyGuidePro planning software, we ask our clients to put numbers on each of their spending goals. Some are obvious, like living expenses once they are no longer working. Others may include home renovations, vacations, new cars, gifts to children, second homes, etc. If it’s a one-time expense, we identify what year the money will be used. If it’s a recurring expense, we talk about “how many” and “how often.” I encourage some clients to create separate accounts for vacations, home projects, etc., so the amount they can spend is visible to them. Several of our clients are planning on giving much or all of their wealth to charity. We have been working on getting them to donate more during their lifetime, yet there’s always the concern they might need the money later. As a planner, you crunch the numbers. But even when I know that a client will probably have enough money, I’m always wondering if something could change and we’ll find out that we were too generous early on. It’s a delicate balance. Some people have an easier time spending money when it arrives in the form of a payment, rather than actively withdrawing it from an investment account. I had a couple who had plenty of assets, but once they stopped receiving payments on two real estate contracts, they fell back to living only on Social Security. I felt very frustrated. They had well over $1 million in investments, yet would complain about things they wanted to do but felt they couldn’t afford. They were also beginning to have health issues that, down the road, might keep them from doing some of the more active things they wanted to do. I convinced them to receive a regular monthly transfer from their investment account into their checking account. I think the starting amount was $500 a month. When they came in for their next review, they talked about how much they had enjoyed having the extra funds, and I showed them that it hadn’t impacted their net worth. Over several years of increasing these transfers, we got them up to a monthly amount that was sustainable, yet allowed them more enjoyment of the wealth they’d accumulated. Nelson: A recently widowed client of mine received a financial windfall as part of a group lawsuit she hadn’t even known she was a party to. It was a settlement related to her husband’s death from exposure to asbestos. She already had more than enough income for her needs, and I could see that this new money might end up simply being folded into her existing accounts. She didn’t have a history of major charitable donations, but I asked her if any civic organizations had been an important part of her and her husband’s life. When she said they and their son had benefited from the Boy Scouts, I encouraged her to donate the settlement to the local Scout Council in memory of her husband. Moriarty: I’m aware of situations where parents who couldn’t deal with their wealth denied their children a chance to learn and grow from inheriting it. In one case, the mother had never spent her own multimillion-dollar inheritance and had never even told her children how much it was. She left it to a foundation, instructing that it be managed and disbursed without naming her as the donor. Not only was she unwilling to claim the money herself, but she deprived her adult children of the opportunity to become philanthropists in their own right. Of course, spending for spending’s sake is not the way you want to go, either. Another client’s father couldn’t get rid of his money quickly enough. After setting up trusts for each child, he gave away all the rest to any cause he encountered that could use the money. He died with very little, but not as the result of a strategic, organized plan. Nelson, a CFP who sold her practice in 2012 and has launched an encore career as a retirement life mentor, also tells these clients that their impulse to scrimp and save for their children’s inheritance can backfire. Knowing how drastically their parents deprived themselves in order to bequeath them this money, the kids may feel guilty and have a hard time enjoying it. Cygan: As a financial planner for 18 years, I’ve worked with many “millionaire next door” clients. Even though they had more than enough money, they held firm to their middle-income values and were fearful of spending it. I’ve found that I need to spend time talking with them about what really matters to them. This often takes many appointments over a few years while they ponder the issue. Spending money on cars or a big fancy house or designer clothes feels uncomfortable to them and would cause anxiety. Yet there are other things that they can justify spending money on. For example, a single woman I work with spent her entire career as a speech pathologist in the local school system. Although she never earned much, she funded her 403(b) to the max every year. She now lives on her pension and Social Security, and rarely taps into her investment accounts. When we update her retirement projections each year, I keep reassuring her that she can withdraw $5,000 a year for travel or unexpected expenses. A few months ago she called me, sounding very worried. She and her partner had decided to treat themselves to a trip to Paris to celebrate their 70th birthdays. But rent for an apartment in Paris was going to be about $3,000, and she was uncomfortable spending the money. I assured her that she could afford the trip and encouraged her to enjoy it thoroughly. Many of my Sage Future Financial clients experienced severe poverty as children, so they will never spend money freely. Just the idea of spending it makes them anxious. Yet they have been avid savers throughout their lives and have accumulated a lot of money. Sometimes it seems like my role is to give them permission to spend. I accept this role. The role of empathetic permission-giver, as Cygan puts it, is a precious gift you can give hoarder clients and their offspring. You might also remind them, if it’s appropriate, that only when they experience the freedom to do the things they want to do will they be truly wealthy.